iPhone revolutionizes mobile videography, from the first slo-mo 120fps video capture since 2013, initiative 4k video recording at 60fps last year, groundbreaking space optimization by courtesy of HEVC support in iOS 11 update, to the extended dynamic range in new XS. But iPhone users still face challenges, bogging themselves down to various problems with video storage, playback, editing, uploading and other processing tasks. There are many factors behind the issues. For example, HEVC ruins playback experience on older Mac and iPhone. Unreasonably huge 4K shots quickly eat up iPhone space, slow down the speed of sending on Whatsapp, lead to choppy playback and freezing edits. Social sites like Instagram degrade iPhone video due to heavy compression and exert a strict restriction on both file length and size. The triumph card to get you out of all troubles rests on iPhone video processing. We will focus on this topic below. 3. Edit: Cut, split, merge, rotate, subtitle, denoise, speed up video. 4. Adjust: Change playback speed, adjust setting, enhance video quality. More than just video editing, VideoProc lets you cut, crop, merge, rotate, deshake, resize, convert and adjust any 4K or oversized videos taken by iPhone, GoPro or other 4k cameras. 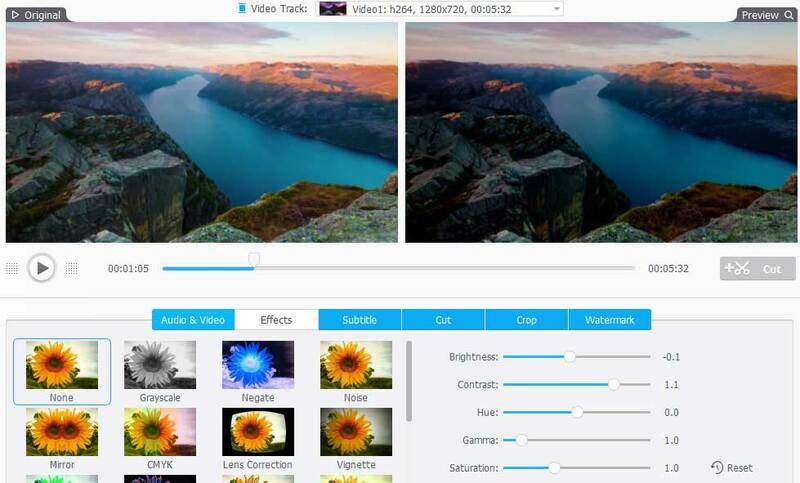 Free download VideoProc and enjoy easy video processing. 4. Can't Play iPhone 4K 60FPS HEVC Video on MBP? Fixed! 8. GoPro/MKV Won't Play on iPhone? 9. iPhone Video Playback Poor Quality? Solved! 15. Any Better Solution to Add Subtitles to iPhone Video? 16. Can I Speed Up iPhone Video More than 2X? 17. How to Make a Normal Video Slow Motion on iPhone? 18. Adobe Premiere Won't Import iPhone Videos? 22. Failed to Convert a 60fps iPhone Video (.mov) to 30fps? 23. iPhone Video/Sound out of Sync? Here's the Fix! You are very pleased to see the tremendous advance on iPhone storage space, from the initial 4GB to the current 512GB. Thus, you're allowed to shoot iPhone video much longer at length, much higher at the resolution and much bigger at the file size. That being said, it's still a double-edged sword. When it comes to uploading your iPhone video to Instagram/YouTube/FB or Email iPhone video for sharing, the hi-res yet larger iPhone videos would encounter waterloo. To help you out of trouble, here we will share with you the quick tips to resize iPhone video for better fitting SNS/Email requirements. Tip 1: Use your iPhone Photos app. Step 1: Open Camera Roll on your iPhone, choose the video you wanna upload and tap Edit icon at the upper right corner of the interface. Step 2: Trim your video length to get your desired video clips based on the final website your wanna upload to. Step 3: Click Done to finish the video cutting. The same also applies to shorten iPhone footage for Emailing (60-90 secs) and saving on memory-constrained iPhone. Cutting your iPhone video in Photos app is rather convenient. Yet, it still has some catching up. Among them, the inaccuracy of editing and ability to trim the beginning and ending only is the one users complain most. We know how small your iPhone display is, especially for the 4.7-inch model. When you pinch to cut your video, it's difficult for your finger to place at the right second or the right frame, since the neighboring frames are so much of muchness. Therefore, to trim and shorten your iPhone footage at an accurate time point, you'd better copy your iPhone video to a desktop to precisely cut video on a bigger screen. To do so, VideoProc - easy yet powerful iPhone video processing software, is what you need. Step 1: Free download VideoProc, install and fire it up on your desktop (Windows & Mac). Step 2: Click the first icon Video on the home screen > tap Add video file to list button to import your iPhone video. Step 3: Click Cut with a scissor-shaped icon and you're directed to the video editing window, where drag the green knob to set the Start time and End time. Or you can directly move the slide bar to cut and shorten your video duration. The preview window clearly shows your video content and helps you precisely save your highlights without any redundance or omissions. Step 4: Click the Cut button (next to the slider bar) > hit Done > choose your output folder for your output files via Browse > press RUN button to begin cutting iPhone clips. Many iPhone users discuss on Apple forum about how to get rid of unwanted parts or black borders from their video picture. Yet, some related answers, if not all, are seemingly not complete, no detailed tips to guide you noob. If you haven't solved this problem, the below tips can help you get around this. It helps you painlessly remove unwanted black bars from iPhone video clip, zoom/highlight the shot you desire via the flexible marquee and manually change video aspect ratio for seamless playback on YouTube, FB, Ins, etc. Step 1: Free download and run VideoProc. Step 2: Tap Video icon on the home screen > click Add video file to list option at the main menu to import iPhone video files. Step 3: Hit Crop to enter the video cropping window, where you're allowed to freely crop and zoom in your iPhone video via the marquee after ticking Enable Crop. Step 4: You can also manually adjust video image size by filling the specific number under Position, which presents the video picture size in digital number so as to help you better fit the SNS video uploading aspect ratio requirements, e.g., 16:9 for YouTube, 1:1 or 4:5 for Instagram, 16:9 or 4:3 for Dailymotion. Step 5: Press Done button and click RUN to begin to crop iPhone video. iMovie is also a nice option to crop and zoom in your iPhone video. If there was one gripe, it would be that iMovie doesn't display the video image size after cropping. Thus, you have no idea about the specific video image size and aspect ratio. In case the aspect ratio has little influence on your iPhone video usage, ignore this and go straight to the iPhone video cropping tips. Step 1: Download and install iMovie on iPhone. Open it > tap Project icon and click "+ Create Project" button > tap Movie on the pop-up New Project window. Step 2: Choose the video footage you want to crop from your iPhone library. Afterward, hit the text Create Movie. Step 3: Your imported video clip will appear on the project. Now tap on the video timeline section and the video editing toolbox will show up below the timeline section, alongside with a magnifier icon at the upper right corner of the video. Step 4: Click the magnifier icon and then you're able to pinch to zoom your iPhone video at your disposal. When video cropping is finished, press Done > tap the sharing button (with an upwards arrow in a box) > select Save Video to save the cropped outputs to your iPhone camera roll. 3.1 - Email iPhone video. Email places strict limits on video file size. Generally, the video you plan to send via Email is supposed to be ranging from 20MB to 25MB. To resize iPhone video smaller to Email, VideoProc is helpful to compress and decode iPhone video from MOV H264 to HEVC, FLV, 3GP or WMV smaller-sized formats with at least 50% bit rate saving. What's plus, it downscales 4K/1080p to 720p at 30FPS to further downsize iPhone video for Emailing. 3.2 - Share iPhone clips to Instagram and Whatsapp. 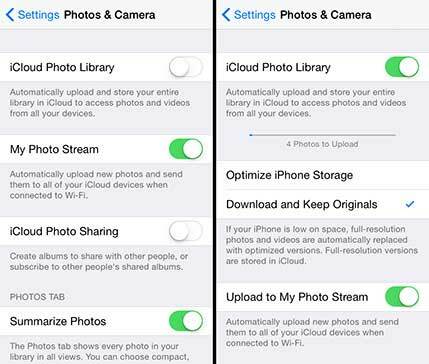 Aimed at short video sharing, Instagram and Whatsapp only accept iPhone video clip with 15MB and 16MB at most. And 1 minute of an iPhone 8 recorded H264 clip is roughly 60MB in size at 720p 30FPS and 130MB at 1080p 30FPS. That's to say, you can also use the video setting options of VideoProc to to lower your iPhone video resolution to 720p 30FPS if the video length is 15 or 16 seconds and compress 4K 30FPS to 1080p 30FPS for the 6-second length iPhone footage. 3.3 - Upload iPhone video to YouTube/Facebook. YouTube and Facebook give you much more freedom in video uploading size. The current maximum file size is 128GB on YouTube and 10GB on Facebook. Hence, as for YouTube, apply iPhone video processing software to adjust iPhone 4K HEVC video from 60FPS to 30/24FPS or decode 4K video from H264 to HEVC. In terms of Facebook, besides video codec conversion and frame rate adjustment, two more steps might be needed - lower video resolution from 4K 2160p to 1080p/720p and decrease video bit rate approximately 20-40%. 1. Can't Play 4K 60FPS HEVC without Stuttering on MacBook Pro/iMac? HEVC video playback at 4K 60FPS is extremely high demanding on computer hardware configurations, at least 10X more computing power needed for video decoding. Your MacBook Pro or 5K iMac probably claims to support 4K HEVC video playback at 60FPS, the chance of smooth playback is still quite slim. To solve the "iPhone HEVC video won't play on Mac" issue, a fast HEVC video converter - VideoProc is a must have, helping you process and decode HEVC to H264, lower 60FPS to 30FPS or adjust 4K to 1080p to improve video decoding speed while video playing. Yet, considering the increased computational complexity of HEVC, there's high likelihood to encounter problems like laptop lagging at 4K HEVC video transcoding, 90% CPU usage, CPU overheating, etc. Thankfully, VideoProc, the world's first program to support Level-3 Intel QSV/Nvidia/AMD GPU hardware acceleration techs, helps you decode and process iPhone HEVC (4K 60FPS) video at GPU processor to make iPhone video processing 5X much faster and relieve your CPU burden to let your desktop stay away from CPU overuse/overheating troubles. If all concerns have been removed, follow the below tips to process your iPhone HEVC 4K 60FPS video. How to Decode iPhone HEVC to H264 and Lower 4K 60FPS? Step 1: Launch VideoProc on your MacBook Pro/iMac. Tap Video > click Add video file to list to load your iPhone HEVC 4K 60fps video or directly drag-drop files to import files. • For older MacBook/Pro/iMac, you're suggested to process and convert iPhone HEVC to H264 codec. 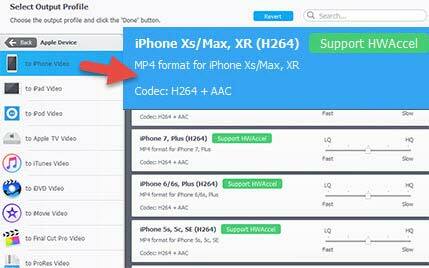 Choose the output profile as iPhone H264 or MP4 H264 under Popular or Video subcategories under Target Format. Here the older Mac computers include MacBook/MacBook Pro 2015 or older, iMac 2016 or older and 27-inch 5K iMac 2014. All of these models lack powerful enough hardware configurations to support HEVC playback. That's the reason why you need to change iPhone video from HEVC x265 to H264 x264. • For newer MacBook/MBP/iMac/iMac Pro, you don't have to decode iPhone HEVC to H264 since they natively support HEVC video playback as long as you update to macOS High Sierra or later. Instead, what you need to do is to downscale 4K to 1080p or change frame rate from 60FPS to 30FPS. Tap Codec Option icon > click the expansion symbol next to Frame Rate to select 30FPS > move your mouse to Resolution to lower 4K 2160p to 1080p > hit Done button. Step 2: Click Browse button to opt for an output folder to save the output files, then hit on RUN button to begin processing iPhone format HEVC 4K 60FPS video at GPU hardware accelerated speed. 2. How Can We Transfer HEVC 4K 60FPS Media Between iPhones without Conversion? Step 1: Head to Settings on your iPhone > access to Photos > make sure that "Transfer to Mac or PC" is set to "Keep Originals". Step 2: Enable iCloud Photo library on your iPhone and a Mac computer. Step 3: The moment iPhone pictures show up on your Mac, open Photos.app > pick out your iPhone HEVC videos > tap File option > hit Export > Export originals. The videos will retain the HEVC file format. Alternatively, you're also advised to firstly transfer iPhone HEVC 4K 60FPS video footage to a Mac via Image Capture using a USB cable. Afterward, copy HEVC files from Mac to your another iPhone. 3. What's the Best Way to Watch iPhone's 4K Shot Video on UHD TV Set? It's really a shame that there's no straightforward guide to tell you how to get your iPhone 4K recordings to your 4K TV set via Apple TV 4K. That's the reason why you spend too much time trying different ways, like streaming, transferring, AirPlay or even conversion. To save your time and energy, here the simplest tips are shared with you to make iPhone 4K video successfully playback on your 4K TV. Tip 1: AirPlay iPhone 4K Video to 4K UHD TV. Step 1: Update your iPhone iOS to iOS 11 or later. Find the new AirPlay 2 on your Control Center. Step 2: Upgrade your Apple TV 4K to tvOS 12 or later. Step 3: Make sure your iPhone and Apple TV 4K use the same Wi-Fi network, which would be better at 25Mbps in bandwidth. Step 4: Open Photos app on your iPhone > select the 4K video you wanna airplay > tap the upload icon with an upwards arrow in the box > tap AirPlay. Step 5: Choose Apple TV 4K and then it will begin to airplay your iPhone 4K video to your 4K TV set. Step 1: Set up Infuse 5 app on your Apple TV 4K and on a network storage host. Step 2: Check if your iPhone and Apple TV 4K are in the same Wi-Fi connectivity, 400mb/minute at least. Step 3: Stream your iPhone 4K video to the bigger screen 4K TV with surround sound and subtitles via AirPlay. 4. How to Play Old iPhone's MOV Videos on New Android? iPhone recorded video is not playing on Android and shows errors message like file format not supported error? Actually, this might be caused by a variety of complicated reasons. For the laymen, you don't have to figure them out one by one. Simply, download and install some Android video player apps to have a try, including MX player, ExoPlayer, KMPlayer, etc. If unfortunately they don't work, you can consider to use iPhone video transcoder software - VideoProc to help you out of trouble with greatest of ease. Tip 1: Auto Copy H264 Video from MOV to MP4 format. Android mobile devices support H264 encoded video in .mp4 container format, instead of .mov format. So, as for the iPhone recorded mov files, the primary way you should try is to auto copy H264 from MOV to MP4 with 1:1 original quality. Luckily, VideoProc provides you with such mode. Step 1: Launch VideoProc on your MacBook/MBP/iMac or Windows PC. Tap Video > click "Add video file to list" at the top menu to load iPhone video clips. Step 2: Tick "Auto Copy" at the lower right corner of the main interface > move your mouse to "Target Format" at the bottom of the window > click "Android Mobile" under Mobile Video Profile on the pop-up output profile interface. 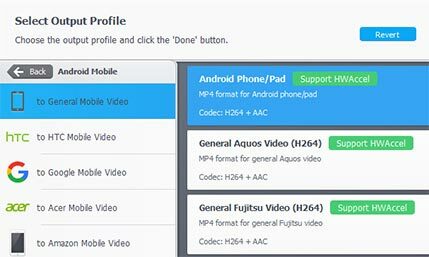 Step 3: Choose "to General Mobile" > select "Android Phone/Pad", the first profile with MP4 format encoded by H264+AAC. The label "Support HWAccel" means the whole H264 auto copy task will be accomplished at Intel/Nvidia/AMD hardware accelerated speed, much faster than you can imagine. You're also able to opt for Huawei, Samsung, Sony, Microsoft profiles from 420+ preset profiles. Step 4: Tap Done > press Browse button to sort out an output folder for outputs > hit RUN button to start to change H264 video container format from MOV to MP4 without any re-encoding. When the video auto copy is done, import your iPhone video to Android to check if it works. Android devices cover a wide selection of brands, including Samsung, Huawei, Sony, Xiaomi, etc. Each brand has its own standards on video codec and parameter settings. 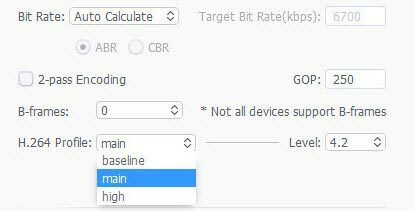 Therefore, you'd better go deeper into your device first and then choose to convert HEVC to H264 MP4 or tweak your video parameter settings. For old Android devices, decode HEVC to H264. The old Android devices contain Samsung Galaxy S6/S6 edge, Galaxy Note 7, Sony Xperia Z5, Huawei P8, Xiaomi Mi 4, LG G4 and their predecessors. HEVC codec is inaccessible on them. Hence, to play iPhone HEVC video on old Android device, you're recommended to decode HEVC to H264 MP4 via the versatile iPhone video processing tool VideoProc. The operating steps are similar to the Tip 1. So it's needless to repeat that. Just don't tick Auto Copy mode. For the flagship Android devices, adjust parameter settings. There is no sweat to playback HEVC x265 video on the latest flagship Android devices, but the problem lies in that some high-level Android devices fail to playback iPhone 4K HEVC video at 60FPS, such as Huawei P20 Pro, Sony Xperia XZ2. In such case, you're required to firstly copy HEVC video from MOV to MP4 format and then adjust video frame rate from 60FPS to 30FPS by clicking Codec Option and then lowering frame rate under Video Codec Options. H264 can be encoded with different profiles and levels. Generally, it's not a tricky thing for almost any devices to decode the Baseline Profile. Yet, it stands a good chance that your iPhone video is encoded with a profile which would lead to playback error on Android device. If this is the case, resort to VideoProc to change H264 high profile to baseline or main level via Codec Option on the home screen. 5. How to Watch MKV, AVI, GoPro Video on iPhone? MKV, AVI and some GoPro video files are not natively supported by your iPhone because of the incompatible video format. But you don't have to be bothered by the videos not playing on iPhone issue, cuz it can be easily tackled by the following tips and tricks. Pick out the one you like to address this problem. To transcode MKV, AVI, GoPro video to iPhone, VideoProc fits the bill to do the video conversion task with virtually no quality loss. More importantly, you don't have to manually tweak any tricky settings, for it prepares over 420 output profiles for you, including the latest iPhone Xs Max, iPhone Xs/XR/X/8/7/6s/6/Plus. Step 1: Import your MKV, AVI, WMV, FLV, GoPro or other incompatible video files to VideoProc. Step 2: Tap Target Format > find Apple Device under Mobile Video Profile > choose "to iPhone Video" > Choose iPhone Xs/Xs Max (H264) or iPhone X/8/Plus (H264) as output profile grounded on your iPhone model. Step 3: Tap Done > hit RUN button and it will begin to process MKV, AVI, WMV, FLV, VOB or GoPro videos to iPhone at GPU HW accelerated speed (if enabled) with best iPhone settings, up to 98% quality reserved. Tip 2: Upload MKV AVI video to cloud storage service. The world-renowned OneDrive, Dropbox and Google Drive are gonna be your best mate to instantly upload videos (MKV, AVI, WMV, FLV, VP8, VP9) to cloud storage and let you access to your video library on iPhone without converting. Take Google Drive for instance. Step 1: Navigate to Google Drive via web browser and log in your Google account. For free account, you have 15GB free storage space to backup your files. Step 2: Click My Drive > tap "Upload files..." from the drop-down list > import your MKV, AVI or VOB files from computer. 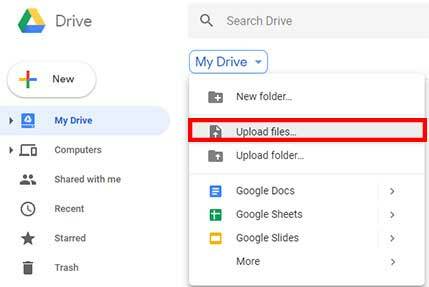 Step 3: It will automatically upload your files to Google Drive. When it's done, it will inform you with a notice "1 upload complete". Step 4: Open your Google Drive app on your iPhone and then you can play MKV, AVI, VOB, etc. video files on your iPhone. To get more solutions to fix AVI/MKV won't play on iPhone, please refer to the guides: convert MKV to iPhone MP4/MOV, play AVI on iPhone. 6. The Quality of iPhone Videos Sent via Text Message Looks Blurry? More than a few iPhone users complain about this issue: why does the iPhone video quality look so bad when I send them via text message (MMS)? The recipient gets something that is similar to a webcam video from 1990s. Actually, the degraded video quality has nothing to do with your iPhone camera, iOS bugs, message app or Apple protocols. Instead, it's closely relevant to with the limitations of MMS and cellular protocols. • Severely trim your iPhone video length. 1 minute of an iPhone 720p video at 30FPS is about 60MB in file size. Hence, you need to aggressively cut your iPhone video length on your iPhone Camera Roll via the built-in trim feature. • Enable iMessage on your iPhone. iMessage helps you send video between iPhones, iPads via data network and Apple's servers, with maximum file size up to 220MB. That's more than enough for you to send crystal clear video image without compression. To enable iMessage, head to Settings > find Messages > turn both iMessage and "Send as SMS" buttons to green. • Email your iPhone recordings. If text message and iMessage don't work well for you, Email is up to the mark to send iPhone footage with 20-25MB size. Camera on your iPhone has undergone tremendous enhancements over the years. 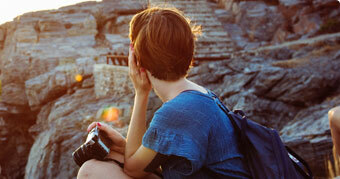 But you may still end up with shooting dark, shaky, grainy or noisy videos in some situations. Do some post processing of iPhone videos proves to be essential, if you are not skilled in high-quality video shooting, or you just want to chop off unwanted parts, stitch together the essential clips for a new one, make a fast motion video from your normal footage, etc. The following shows the most essential iPhone video editing and processing tips, together with the typical problems, such as laggy 4k video editing. iPhone users complain the videos they shot either in portrait or landscape orientation rotate automatically. These footages even end up sideways or upside-down when playing on computer or after uploading to Facebook, Flickr or more. Follow the tips below to shoot video in the correct orientation, and reorient it with a video rotator. Step 1: Position the iPhone camera to the correct orientation before you record. Step 2: Hold it for a second in order to allow the accelerometer and gyro to determine what position your camera is in. ● Landscape oriented video is preferred if you intent to view on TV, computer or other widescreen device, as shooting in horizontal position allows to capture video in widescreen format. ● As of 2017, Instagram, Snapchat, Facebook, Twitter and many other social apps embrace the portrait oriented video format now. So if you are going to upload video to the social sites directly from iPhone, go and shoot video vertically. ● We suggest to keep the same orientation while shooting a video. A video with different orientations, though seem OK on your iPhone, play weird with obviously changed position on another device. To prevent the iPhone screen from rotating, just swipe up from the bottom of the screen to reveal the Control Center > Tap the rotation lock icon to lock the screen. If your portrait video goes upside down or landscape video is not being rotated properly, you can still get out of the trouble by reorienting your iPhone video with VideoProc. Follow the steps below. Note: VideoProc is an easy and all-inclusive video processing and editing software. So please make sure to download it on your Windows or Mac as per your needs and sync your iPhone video to your computer with a data transfer tool. Step 1: Launch the iPhone video processing software. Click Video button on the main interface. Step 2: Hit +Video to load iPhone video from your computer hard drive. You can process more than one iPhone video at a time. Step 3: Click Rotate icon on the main interface to get access to the video rotating panel. Step 4: Click Rotate Left or Rotate Right to flip the video right way. It allows to rotate iPhone video footage by 90, 180, 270 degrees clockwise and counterclockwise. You can also flip the video vertically and horizontally. Tap Done after the rotation. Step 5: Press RUN button to begin the reorientation of iPhone video without any loss in quality. Then you can make sideways video right up or change video orientation from landscape to portrait. It's pretty easy to shoot a video over 15 minutes long. But almost all video sharing sites limit the videos to less than 15 minutes. So splitting video is much asked. iPhone's Photo app provides you video trim feature. Just tap the screen to display the controls and drag either end of the frame viewer. But chances are that we want to adjust the duration, remove unwanted clip or add different titles, or so, give iMovie a shot. Step 1: Drop the clip in your Project. Step 2: Scroll the timeline and position the cursor where you want to split the clip on iPhone. Step 3: Tap the clip till you see it is outlined in yellow. Step 4: Swipe down over the playhead to slice through it. Note: It's a cinch to split video on iPhone in iMovie. 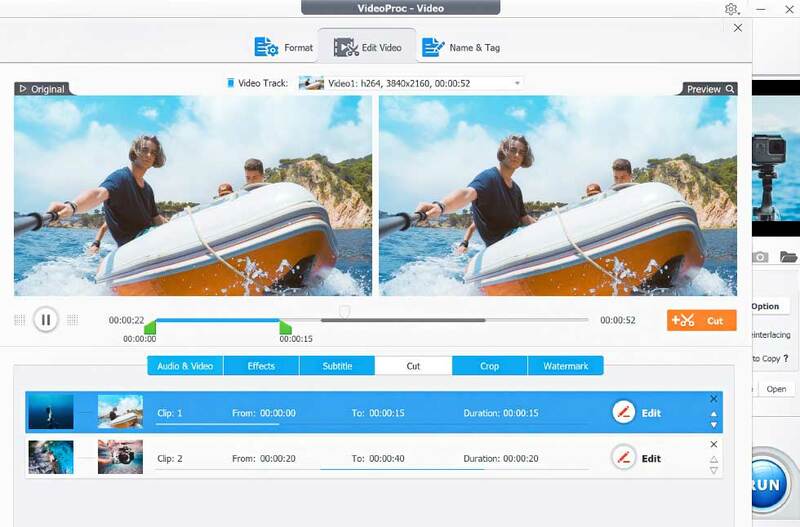 But defining the video length, size or duration of the video you split goes beyond iMovie's reach, VideoProc is your best bet to process and split a video clip into two or more separate clips on Mac and Windows by segments and duration. Step 1: After you initiate the Video window of VideoProc, you can import one or more iPhone videos by hitting +Video button. Step 2: Move your mouse to the bottom of the window > tap Toolbox > Double click the Split button to enable and open the video splitting setting window. Step 3: Split video according to segments or duration. And hit Done button. ● On the left panel, move the green knobs to trim off redundant parts. ● On the right panel, choose to split iPhone video in segments or seconds as per your needs. Step 4: Click RUN button to start splitting video taken by iPhone. The default video format is MP4 H.264. Or you can change the video format you like. 3. Merge iPhone Video: How to Combine Short Videos into a New One for a Home Movie? At times you want to combine your favorite genre videos into a single video or put the funny moments of your baby together to make these fragments compact and compelling. 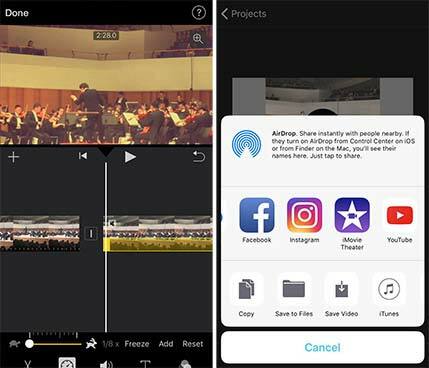 iPhone's Camera Roll allows users to trim video easily without any third-party video editing app, but it is absent to merge short clips into a large movie. No wonder we find many cries for an easy video joining guide on Apple support forum. Here's what you are looking for. iPhone users from Apple support forum indicates iMovie ruins the quality of video and removes the 60fps when joining the short video clips, and they seek for a quick video merging tutorial without additional compression. VideoProc can simply combine separate clips together without re-encoding or quality degradation. Step 1: Enable the Video processing window by clicking Video button on VideoProc. Press +Video button to add the iPhone clips. Note: VideoProc is a desktop video editor. Make sure to download iPhone clips on your computer first. Step 2: Choose the output format. Since video taken by iPhone is either H.264 or HEVC, just choose the video format MP4 H.264 and keep the output setting (codec) unchanged. Step 3: Check the box Merge on the right side of the window. Make sure the box Auto Copy is checked, which allows to copy the iPhone files without re-encoding anymore. Note: Any change of codec will lead to compression in the process of video merging. And make sure the video clips you are going to combine are encoded with the same codec. Step 4: Tap RUN button to start joining and combing the video clips together. Press Video after you launch VideoProc > Click +Video to add more than one iPhone clip > go to Toolbox at the bottom of the interface > double click Merge > move the green knobs to chop off unwanted parts. You can repeat the steps to trim other clips taken by your iPhone > Click Done to return to the main interface > press RUN. Press Video after you launch VideoProc > Click +Video to add more than one iPhone clip > Go to Video at the bottom of the interface > choose the format MKV H.264 > make sure the Merge and MKV Multi-Track boxes on the bottom right corner of the window are checked > press RUN to start merging multiple tracks in MKV. iPhone is equipped with a four microphone system and features Phone Noise Cancelation to reduce ambient noise on phone calls, which however don't yield in high audio producing. While creating a family movie, making a speech, recording a street interface, or so, iPhone produces background noise such as loud static noise, annoying traffic noise, electronic sound, wind noise, or any other unwanted ambient hums and buzzes. 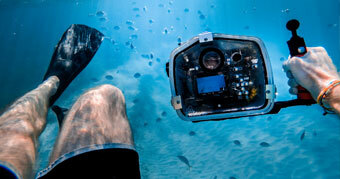 As a result, our personal recordings sound distracted and noisy. How to remedy the situation? 4.1. Take the protective plastic cover off iPhone and try recording. Some protective plastic hinders the mic. 4.2. Check if it is the hardware issue. Sometimes the speaker in the front of the iPhone won't work and cause the loud static sound problem while recording video with iPhone. 4.3. Try using a noise-canceling mic and an anechoic chamber to suppress the harmful sounds. Basically, unwanted noises such as buzzing lamps, street noises, mic issues are inevitable while recording with iPhone or any other camcorders, cameras. But you won't have to throw your footages into the garbage. Instead, you can post process your iPhone video to reduce or eliminate iPhone background noise with VideoProc. Step 1: After you download iPhone recordings onto your Mac, open VideoProc and Click Video to activate the Video Converter Window. Step 2: Tap +Video button to add the iPhone video from which you'd like to remove background noise. Step 3: Click Toolbox at the bottom of the interface. Double click Denoise button to enable the Denoise Window. 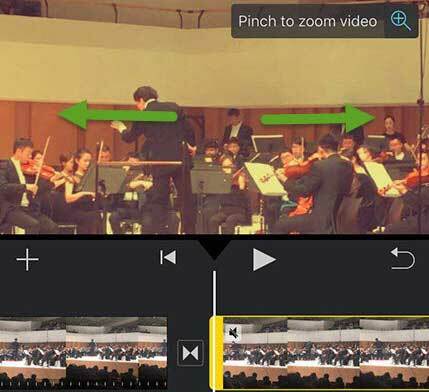 ● To reduce the disturbing noise from a clip, just trim the video by moving the green knobs on the left panel. ● On the right panel, adjust High Pass and Low Pass to reduce the noise. If you are unknown of the settings, keep the default settings unchanged, which are optimized for the best possible noise reduction effect. Click Done. Step 4: Click RUN to start reducing iPhone video noise. 5. Deshake Video: How Can I Stabilize a Shaky Video Recorded by iPhone? It's unavoidable that your iPhone recorded video would be shaky even though it's armed with an advanced tripod. If your shaky iPhone video gives a really bad quality, you can try the below tips to stabilize it and improve its quality as much as possible. Deshake your iPhone video using the powerful video stabilizer VideoProc, with which you're able to 1 click fix video shaking problem without any further fuss or ado. Step 1: Import your iPhone video to VideoProc via "Add video file to list" or direct drag-drop way. Step 2: Click Deshake from Toolbox in Target Format menu. Step 3: Freely adjust the deshake settings including shakiness, accuracy, step size and minimum contrast if you're an expert in this side. Or just keep the default settings that the program automatically set for you. Step 4: Tap Done > press RUN button to begin stabilizing your iPhone video. When the iPhone video processing is finished, open it and you will find the output video becomes much more stable than before. Of course, this application is not omnipotent. It can't rescue your recordings if your footage is shaky to be blurry and interlaced. You'd better re-shoot a video. 6. How to Add Subtitles or Translations to My Video on iPhone? 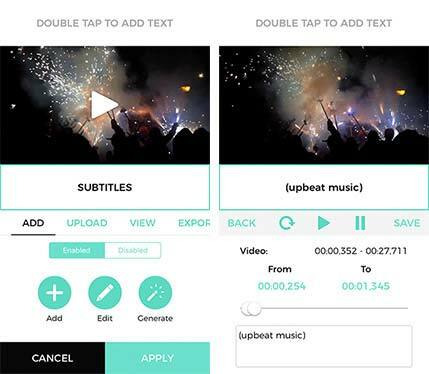 To add subtitles to your video clip on iPhone, one brilliantly simple app called Veme.ly can serve for you. Go to App Store to download and install it. Then follow the steps below to put subtitles or translations to your iPhone footage. Step 1: Open Veme.ly > select from 60 templates designed for your square 1:1 videos, long 4:5 videos, and vertical 9:16 videos. Step 2: Load the video from iPhone to this app > do some trimming or cutting on your video if necessary > click Subtitles option > tap "Enabled" on the upload window > hit "Upload" icon. Step 3: Opt for your SRT subtitles from your cloud storage service, such as iCloud, OneDrive, Google Drive, etc. Step 5: Now it begins to process your subtitle file and insert the text or translations to your video at times specified in SRT file. Step 6: Check if every single subtitle text is at the right position of your video. If not, edit your subtitles. Step 7: Export iPhone video to save on your camera roll when everything is fine. 7. What Software Can Speed Up Video from iPhone Camera Roll More than 2X? Step 1: Import your video to VideoProc. Tap "Effect" with a magic stick icon on the video information display bar. Step 2: You're directed into the "Edit Video" window, where you move the mouse to click "Audio & Video" option. Step 3: Find "Playback Speed" > freely move the slide bar to adjust the video playback speed. Faster or slower, it's all at your willing. Step 4: Tap Done button > click "Browse" button to sort out a destination folder for output files > hit "RUN" button to begin speeding up your iPhone video. 8. How to Make a Normal Video Slow Motion on iPhone? When it comes to slow down your iPhone video, the best option appearing on your radar should be iMovie for iOS, which lets you slow down video playback speed by 20% - 87.5%. So your general need can be satisfied to the maximum extent. Step 1: Open your iMovie > click Projects > tap create project icon "+" to load your video from iPhone > click Movie and your movie project is created. Step 2: Tap the movie timeline to select iPhone video clips you wanna slow down. Step 3: Slow Motion option is placed at the 2nd position from the pop-up video editing bar. Step 4: Move the slide bar from the central place to left, which will range from 4/5X, 2/3X, 1/2X, 1/3X, 1/4X, 1/6X to 1/8X. You can also click the "Play" icon to have a preview. Step 5: Press "Done" button when the video slow down adjustment is finished > tap the upload icon with an upwards arrow to export projects to your iPhone. 9. iPhone Video Editing Issue: Adobe Premiere Won't Import iPhone Videos? The problem that iPhone video can't open in Adobe premiere might be mainly caused by two possibilities. Case 1: iPhone 4K video in HEVC codec. At least 5 users out of 10 have no idea that Adobe Premiere has poor compatibility with HEVC codec. Only the latest version of Premiere supports HEVC video editing. Hence, to make iPhone video successfully add to Premiere, update Premiere to the latest version or edit your iPhone video on PC via VideoProc. Case 2: iPhone video recorded in VBR. In general, variable bit rate (aka. VBR), instead of constant bit rate, is applied into iPhone video recordings. However, older version of Premiere (version 12.0.1 and below) doesn't support VBR video. That explains the issue. 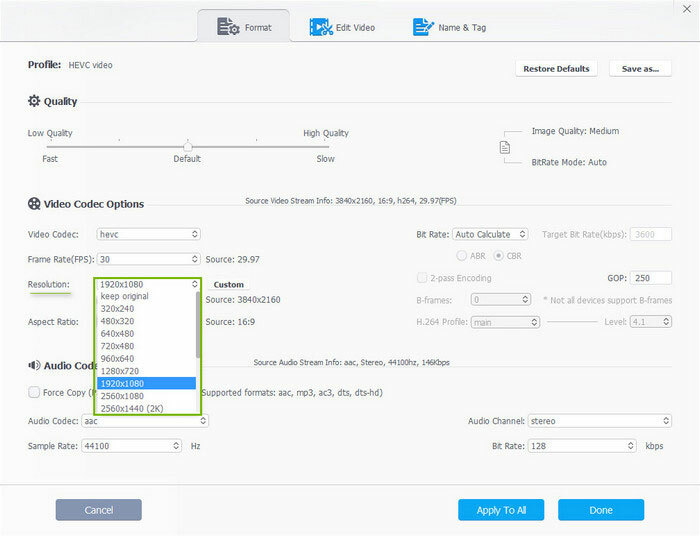 In a bid to process iPhone VBR video, resort to the smart approach VideoProc, which is specialized in processing iPhone VBR videos in whatever codec, H264, MPEG-4 and HEVC. Download to handle your iPhone VBR video editing. Getting started with video on iPhone is easy peasy, but customizing video settings for various circumstances is rather tough. Many an iPhone user orders the latest iPhone XS or iPhone XS Max for 4K video recording, but they are ignorant of the way to enable iPhone 4K resolution. Or they know how to shoot a video in 4K 60FPS, but they have no idea how to change 60FPS to 30FPS to halve file size. Some owners of iPhone are annoyed by dark video when shooting in dark light and ask for the correct iPhone video settings to brighten it up. Other similar cases are not listed here. Anyway, to adjust your iPhone video settings for the best possible results, spend 2 minutes here to read the below iPhone video tips Apple won't tell you for reference. iPhone 4K video recording is 4 times as many pixels as that in 1080p full HD. So what does this mean? Well, it shows 4K will look much better than 1080p. Lines will be sharper, curves will be smoother, and the level of detail will be far greater. All of these 4K benefits allure you to record your iPhone video in 4K, rather than 1080p. But some, if not all, don't know how to shoot video footage in 4K 2160p on your iPhone. No biggie. 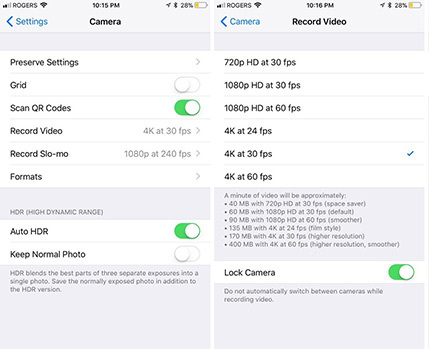 Follow the below tips to enable your 4K video recording on iPhone. Step 1: Open Settings on your iPhone (e.g., iPhone X) > tap Camera. Step 2: Slide down to "Record Video" > change the default setting 1080p HD at 30fps to 4K at 24/30/60fps. Step 3: One minute of an iPhone 4K video will be around 135MB (24fps), 170MB (30fps) and 400MB (60fps) encoded with HEVC codec. So opt for the one based on your iPhone storage space. 2. How to Adjust Brightness of a Video Clip on iPhone? Chances of shooting dark video are high among iPhone users, especially when they are at night or under low light. This is typical as compared to taking photos. Professionals know video shooting is against the limits of what a small lens can capture, even the manual exposure in the condition neither works nor makes difference. Some suggestion still put this dark video problem down to the frame rates. They even suggest faster frame rate means less light can be let into the lens. If you are embarrassed with this problem, check the iPhone video processing tips here. Tip 1: Shoot video in iMessage app rather than Camera app. This is because the ISO is locked at 100 when taking videos with the rear camera. This leads to dark iPhone video problem. Tip 2: Drop the frame rate, e.g. from 60fps to 24fps. Tip 3: There are 3 factors deciding the video brightness: aperture, shutter speed and ISO (sensitivity). You are suggested to increase the ISO to compensate if you want to fix the dark video in low light. Bear in mind noticeable noise will be created if you raise ISO too high. Tip 4: Swipe up from the bottom of your iPhone and enable Control Center > move the slider all the way to the right to raise the brightness level on your iPhone. Unlike apps that are bogged down to chromatic aberration and even misoperation due to its small screen, desktop video editor makes every edit clear and more detailed without the need to zoom the video. Plus, you don't have to worry about the storage issue associated with iPhone and enjoy more stunning features which general iOS apps won't have. iMovie for iOS doesn't possess brightness adjustment feature, which, however, can be compensated by VideoProc. It gives you the ability to light up your dark iPhone recordings via brightness, contrast, hue, gamma and saturation. Brighten your iPhone video now! Step 1: Fire up VideoProc > import your iPhone video into this software after iPhone video to Mac/PC transferring. Step 2: Tap Effects at the video info display bar > move the slide bar to freely adjust your iPhone video brightness, contrast, hue, gamma and saturation. You can preview the video effect and reset what you've done if you're not satisfied with your adjustment. Step 3: Choose special effect for your recordings if necessary. It covers grayscale, negate, noise, mirror, sharpen, painting and more. Step 4: Click Done > choose "Browse" button to choose destination folder > last hit goes to RUN button. Many iPhone users are high on creating square videos for social media such as Instagram, Facebook, and more. Chances are the video taken by iPhone is mostly in landscape or vertical mode. Even though the social networking platforms are tolerant for these types of videos nowadays, they still want to change the landscape video (16:9) /vertical video (4:5) into square video (1:1) first and eliminate the borders to minimize the distraction. To do the job, VideoProc is definitely worth considering when choosing a decent video editor to change aspect ratio. Its intuitive interface and vivid icons walk you through each step without any confusion. 4. How Do I Convert a 60fps iPhone Screen Capture Video (.mov) to 30fps? Customers from Apple support forum notice frame drops when uploading a 720 60fps iPhone video to Vimeo, which leads to choppy playback. Some users blame for difficulty in 60fps video playback on some devices and systems. They ask for a frame rate conversion from 60fps to 30fps before going to Vimeo to reduce choppiness or for smooth playback. Here is the solution. Step 1: Launch all-round iPhone video processing software VideoProc and import your iPhone video via Video option. 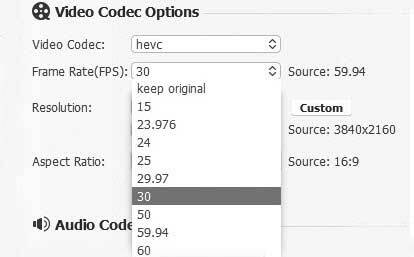 Step 2: Click Codec Option next to the preview window > find Frame Rate under Video Codec Options > choose 30FPS from the drop-down list. Step 3: Tap Done and go back to the main interface. Step 4: Hit Effect at the video info zone > change to "Audio & Video" option > place your mouse at Playback Speed. Step 5: Click the upwards icon to slightly increase playback speed from 1.0X to 1.1X > hit Done button. Step 6: Now hit RUN button and it starts to convert 60FPS to 30FPS with virtually no quality loss. Note: if you wanna convert 120FPS iPhone video to 60FPS or 240FPS to 60FPS, you need to speed up video playback to 2X and 4X. Are your video and audio getting increasingly out of sync towards the end of the file? Typically, audio and video out of sync issue is common among iPhone users who do edits in some video editing software. This is because iPhone generally records video at a variable frame rate, which is out of reach by common post processing tools like iMovie, Adobe Premiere CC. If you want to fix the audio delay, free download VideoProc to fix your iPhone video audio out of sync trouble. Step 1: Launch VideoProc on your desktop > click "Video" button > tap "Add video file to list" to load your iPhone video source. Step 2: Click Effect with a magic stick icon at the video info display zone > press "Audio & Video" option. Step 3: Tick "Recalculate Time Stamp (Force A/V Sync)" > hit "Continue" at the pop-up warning window. Step 4: Tap "Done" button > choose an output folder to save the output file via Browse > click RUN button to begin to fix iPhone video audio out of sync issue. Now you would have further acquaintance with a broader concept of iPhone video processing, which is not only limited with iPhone video editing, but also covers video resizing, transcoding and settings adjusting. And more tips and tricks concerning iPhone video processing might be needed since continuous problems and errors occur. Unfortunately, I don't have enough space in this article to discuss all of the important iPhone video issues, so some of them are left for later articles. Certainly, our professional support team is always here to render assistance for you if necessary. iMovie vs VideoProc: Which One is Better for iPhone Video Editing & Processing? Follow the guide to successfully send large video on Whatsapp iPhone. Easy solution to fix iPhone mov video won't play on mac error.